For those of you who have been following the blog recently, you’ve noticed it is Crooner Month here at Bluebird Towers. This morning on the way to work I had the strange song “Artificial Flowers” playing on my i-pod during a walk I was forced to take when someone shut Baker Street station because of a silly fire. “Artificial Flowers” is one of the oddest songs I have ever heard; it is a protest song against child labour, set to a upbeat, big band swing tempo. It’s jollity is disturbing. Lyrics include “They found little Annie all covered with ice / still clutching her poor frozen shears” having spent a short and fruitless life making artificial flowers until “her baby fingers went numb”. 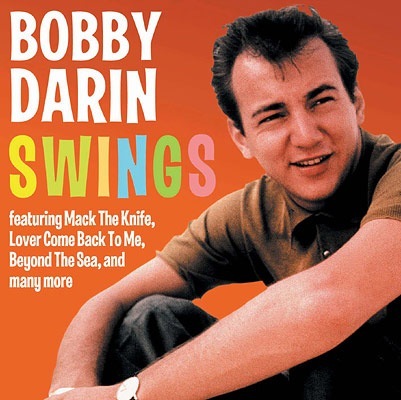 The singer is Bobby Darin. It’s utterly mad. The awful thing is, the orchestration is so sublimely danceworthy you want to boogie to it, but then are plagued by guilt that you are dancing to the story of sweated labour and a child’s death. But perhaps singing about a child that dies was a very different matter for Darin himself, who – it was thought – was unlikely to survive the perilous business known as childhood. After developing rheumatic fever at the age of 8, Darin (whose real name was Walden Robert Cassotto) was told he would probably not live to see 16. The rest of his life was conducted in a frenzied rush as he tried to cram a whole life into the short amount of time he felt he had by producing a vast amount of music, TV and film roles. His vocal tone on his best recordings is therefore forceful, warm but defiant; with a friendly rasp in his tone adding extra ballast. He wants you to remember him, keen to establish his musical legacy before death sweeps him up. will brush the cobwebs away. Released in 1964 but still fresh as a daisy, it’s such an high-energy performance by Darin, that it will restore you with your will to shimmy through life forthwith. You will, however, get odd looks on the Central Line when you start dancing along to this one in the rush hour. It is a riot of raucous, contagious song which every day should start with. Its ridiculously good fun. Get your 1950s kicks on i-tunes, courtesy of Sig. B Darin, kids. He’s like a more modern and slightly less debonair Dean Martin, whose universally accessible style hits you right between the ears, which is exactly where it should. His voice – which once heard is not easy to forget – forges a swift and hip meeting point between swing and rock ‘n’ roll. The man in the big rush released just over 30 albums, was nominated for one Academy Award, won a Grammy Award and hosted his own TV show. He died during heart surgery at 37.